NEW DELHI: Fifteen years after a LTTE suicide bomber killed Rajiv Gandhi in Sriperumbudur, the Tamil rebel outfit on Tuesday admitted its responsibility for the crime and delivered a public apology. In an interview to a TV network on Tuesday, Anton Balasingham, LTTE ideologue and one of Tiger chief Velupillai Prabhakaran's confidants, executed a major shift of policy, describing the May 21, 1991, killing of Rajiv Gandhi as "a monumental historical tragedy". "As far as that event is concerned...I would say it is a great tragedy... a monumental historical tragedy... which we deeply regret, and we call upon the government of India and people of India to be magnanimous to put the past behind... and to approach the ethnic question in a different perspective," Balasingham said. Asked if the LTTE could promise that it would not commit such acts again, Balasingham added: "We have made pledges to the government of India that under no circumstance will we act against the interests of the government of India." Thus far, the LTTE has denied that it was responsible for the killing of Rajiv Gandhi. Reacting to the LTTE admission, Congress general secretary Digvijay Singh said: "It's good that after so many years they (LTTE) have admitted to having killed Rajiv Gandhi. For India, it was a national tragedy because Rajiv Gandhi was the most popular leader of his time. Now the question is of fixing responsibility for the crime." In another interview, minister of state for external affairs Anand Sharma said it would be impossible to put the past behind, as Balasingham suggested, because India had "rule of law" and it could not be seen to be condoning the politics of violence by rehabilitating the LTTE. The belated LTTE admission of guilt has less to do with genuine remorse than the compulsion to drive a wedge between India and Sri Lanka, say analysts who have followed the LTTE for years. At this point, the Tigers' interest would lie in preventing the growing convergence between India and the Lankan government, particularly in the defence sector, which has ramped up Sri Lankan capability, especially against the LTTE. Balasingham reminded everyone of the fact that India had initially trained the LTTE, asking it to return to a more active role. The LTTE statement comes as the outfit finds itself with virtually no friends, especially after the European Union banned it last month. 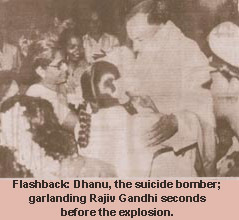 The bomber, Dhanu, shortly before the suicide bomb attack. 1980: his brother Sanjay dies in a plane crash. 1981: His mother, Indira Gandhi convinces him to join politics. - Rajiv Gandhi leads the congress party to a sweeping victory and succeeds his mother as Prime Minister. 1987: sends the Indian Peace Keeping Force to Sri Lanka mediate an end to Tamil-Sinhalese violence there. 1988: Allegations of corruption in the Bofors scam diminish his popularity. 1991: while campaigning for the elections, he is assassinated by a Tamil militant suicide bomber in Tamil Nadu. They said it was their revenge for india's intervention in the civil war in Sri Lanka. 1999: Rajiv Gandhi is posthumously charged with participating in a kickback scheme in a Bofors arms deal. Rajiv Gandhi entered politics only after the death of his brother, Sanjay Gandhi, in 1980. Rajiv Gandhi had not shown much interest in politics till then. He attended college at Cambridge, England; married an Italian, Sonia Gandhi; and worked as a pilot for the Indian Airlines. Rajiv's mother, Indira Gandhi, was active in India's national politics as she had by then served as the Prime Minister of India. Rajiv Gandhi's brother was an aide to their mother in politics. So when Sanjay Gandhi died, it is said that Indira Gandhi convinced Rajiv Gandhi to enter politics. But Rajiv Gandhi was not new to politics as he was born into a family of politicians. 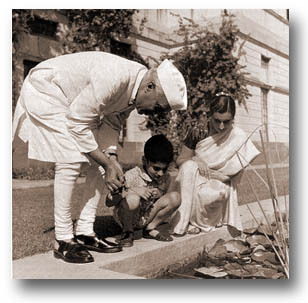 His grandfather, Nehru, was the first Prime Minister of India. His mother, father and brother too were politically very active. Rajiv Gandhi won his first parliamentary elections to the Lok Sabha in 1981. At that time, Indira Gandhi was re-elected as the Prime Minister and Rajiv Gandhi became her unofficial political advisor. But in 1984, Indira Gandhi's bodyguards assassinated her and Rajiv Gandhi took over as the head of the Congress party and was sworn in as the Prime Minister. His government encouraged foreign investment, and industry boomed with the loosening of business controls. He sought to increase Indian investments in modern technology. He removed many restrictions on imports and encouraged foreign investment. His critics claim that he was indecisive as he changed his cabinet members frequently. He fired his mother's aides and instead appointed his friends and technocrats. In 1987, he committed the Indian Peace Keeping Force (IPKF) to Sri Lanka in an endeavor to help the government there eradicate militants agitating for a separate Tamil homeland. Though one of the campaign promises of the Congress party was to eliminate corruption in politics, Rajiv Gandhi's tenure as Prime Minister was marred by allegations of corruption. He was accused of receiving "kick-backs" from a Swedish company manufacturing Bofors machine-guns. In elections in November 1989 Gandhi won his seat, but the Congress Party lost its majority and he resigned as prime minister. He and his party's implications in corruption scandals decreased their credibility as a strong party. Rajiv Gandhi began to campaign again in 1991. It was while he was campaigning in Tamil Nadu in south India that a Tamil sucide bomber took his life. They said that it was revenge for intervening in Sri Lanka's politics. 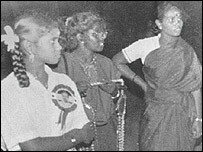 In 1998, 26 members of a separatist guerrilla group known as the Liberation Tigers of Tamil Eelam were convicted of Gandhi's murder and sentenced to death. And in 1999, Rajiv Gandhi was posthumously charged with participating in a kickback scheme in a Bofors arms deal.